In September 2000, world leaders made a commitment to build a more equitable, prosperous and safer world by 2015 and launched the Millennium Development Goals (MDGs). In the previous year, the World Health Organization and the International Agency for the Prevention of Blindness in partnership launched the global initiative to eliminate avoidable blindness by the year 2020-VISION 2020 the Right to Sight. It has focused on the prevention of a disability-blindness and recognized a health issue-sight as a human right. Both global initiatives have made considerable progress with synergy especially on MDG 1-the reduction of poverty and the reduction in numbers of the blind. A review of the MDGs has identified the need to address disparities within and between countries, quality, and disability. Noncommunicable diseases are emerging as a challenge to the MDGs and Vision 2020:0 the Right to Sight. For the future, up to and beyond 2015, there will be need for both initiatives to continue to work in synergy to address present and emerging challenges. In September 2000, at the United Nations (UN) in New York, 189 world leaders committed themselves and the countries they led, to build a more equitable, prosperous, and safer world. The commitment was time bound, by 2015. It contained detail of setting eight goals, targets, and indicators for each. 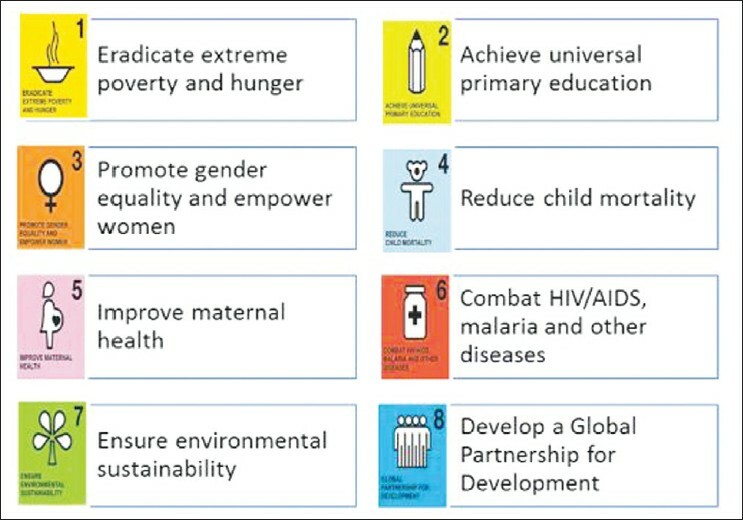 Thereafter it was rolled out to the world as the Millennium Development Goals (MDGs) now familiar in symbols and stated goals [Figure 1]. Disability is both a cause and consequence of poverty. The disabled suffer from exclusion, in its wider sense, which pushes them into poverty. In contrast, living in poverty makes people victims of conditions and situations, which cause disability. Thus if one uses the multi-dimensional understanding of poverty, many causes of disability and poverty are at the same time a dimension of poverty. At the launch of the MDGs, disability was not included in the elaboration of the campaign. The launch of the UN Convention on the rights of persons with disabilities in 2006, placed disability as core to the achievement of the MDGs. WHO estimates that by 2050, there will be 20 billion disabled of whom 80% will live in the developing world. Tragically almost 90% of persons with disabilities live below the poverty line in developing countries (United Nations figures). VISION 2020 aims at the elimination of the avoidable causes of a disability-visual impairment/blindness. Trachoma, a major cause of preventable blindness is strongly associated with poverty. Visual impairment has been linked to the loss of economic productivity. Persons with cataract, the global leading cause of avoidable blindness, were poorer in terms of assets and self-rated wealth, and were less likely to engage in productive activities. They also had a worse quality of life than their normally sighted counterparts. Any investment in eye health that arrests the slide from good vision into visual disability can thus be considered to directly address the reduction of poverty in its multi-dimensional sense. Vision is associated with the eyes-part of the facial appearance and wholesomeness and self-esteem. A disfigurement of the eyes is a disability as it results in stigmatization, discrimination, and low self-esteem. This aspect can also be linked to poverty. Further, the UN emphasizes the measurement of disability by the functional limitations of the individual. This method of assessment ensures the links of visual disability to the development of a person-centered approach in eye health. In every country, people blind and vision impaired are part of the disabled group and suffer all the risks and disadvantages inherent in being disabled. All groups involved in eye health are and should be involved in the disability movement advocating for the rights of the disabled, provision of services, and the empowerment of the disabled. Since each person expects a continuum of care, the future demands a closer synergy between the services for prevention of disability, unavoidable disability, and the disability movement. According to the WHO, people aged over 80 years have doubled since 1980 and the number is estimated to reach two billion by 2050, with most of the increase being in developing countries. Over 70% of blinding conditions occur in persons aged 50 years and above. Age-related chronic eye diseases such as cataract, diabetic retinopathy, glaucoma, age-related macular degeneration, and uncorrected presbyopia will certainly increase. Diabetes and tobacco use are risk factors for cataract, further compounding the burden of blindness in the aged. The aging of the world's population has direct implications for eye health programs-an increased need for eye care services and an opportunity for contributing to the achievement of MDG 1 by reducing visual disability and providing a comprehensive health care system for the aged. MDG 1 also aims at eradicating extreme hunger. Globally, hunger causes 20% of impairment. The WHO estimates that between 250,000 and 500,000 children go blind every year from Vitamin A deficiency. By participation with and integration into comprehensive child health and nutrition programs, eye health services contribute to the reduction of extreme hunger and its consequences. Agricultural programs, school gardens, disasters, and conflicts may seem far removed from eye health services but these have a direct impact on a population's eye health. Knowledge of and collaboration with these development activities which eradicate extreme hunger are part of an overall strategy to reduce visual disability. Vision0 2020 eye health programs, through providing evidence for, advocating for and providing services for refractive error in children and adults, contributes to ensuring good vision for children and adults and thus their education. For example, Vision0 2020 regional programs in the Eastern Mediterranean Region have developed guidelines for school health programs. In all regions, screening of 5- to 15-years olds yields most health effects, while screening of 11- to 15-years old is the most cost-effective. Through health education children can become agents of change for health in their families and communities. In many developing countries, children are assigned to assist blind relatives. Eliminating blindness in adults would release these children from such duties giving them the opportunity to go to school. VISION 2020 programs have developed a range of initiatives to find children who are blind and organize childhood blindness campaigns. For example, the 'restore sight in cataract' campaigns in Bangladesh and the 'prevent blindness from retinopathy of prematurity' in Latin America. ,,, A seamless link between eye health services, education, and disability sectors will ensure that irreversibly visually impaired children will also achieve primary education and be part of the Education for All campaign. School enrollment rates have increased, however; support is still needed for strategies to increaseretention l, address marginalized groups and ensure the removal of the gender disparity, etc. to accelerate the achievement of this MDG. Eye health programs will need to be part of these efforts. Over half of the world's population, including half a billion children, now live in cities and towns. Many of these children live in desperate conditions without electricity, water, or health care, with poor sanitation and exposure to dangerous substances in urban rubbish dumps. To raise the family income, many children are forced into exploitative and dangerous work. Children in urban slums are increasing as a marginalized vulnerable group. It is estimated that 112,000 cases of congenital rubella syndrome (CRS) occur each year with the children having lifelong heart problems, experiencing deafness and blindness. Congenital cataract, which can be due to CRS, is estimated to account for 3-19% of blindness in Africa. The measles and rubella initiative was launched in 2011 and aims to provide the measles and rubella vaccine in a single shot in the 62 countries which currently do not provide rubella vaccination. The initiative also has components for communication and community development, research and development. Eye health programs that deal with congenital cataract can participate in this initiative, in the elimination as well as the surveillance phases. This MDG, more than any other, focuses on the need for human resources for health. The attendance of births by a skilled worker is the indicator for the assessment of human resources for health. Strategies for the strengthening of human resources for health, (for example, task sharing, better personnel-population ratios, community, and home care) are common to services to improve maternal health and eye health. Mainstreaming eye health into general human resources for health development provides opportunities for sharing the lessons learnt. MDG 6 aimed at addressing the main causes of mortality and has shown remarkable achievement. WHO has shown a decline in the new human immunodeficiency virus infection/acquired immunodeficiency syndrome (HIV/AIDS) cases by 17%, while tuberculosis has been more successfully treated. 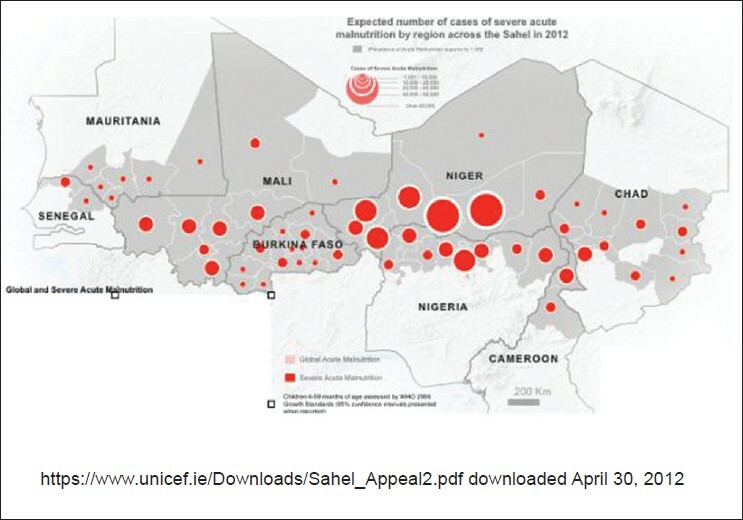 For malaria, 42 countries are on target to meet the MDG target. However, neglected tropical diseases (NTDs) affect the lives of more than a billion people and threaten the health and productivity of millions more. They affect the most vulnerable populations pushing them further into poverty. Onchocerciasis and blinding trachoma are 2 of the 10 NTDs, which were targeted in January 2012 for either elimination or control in a new global partnership. The remarkable achievements of the 'Africa Program for Onchocerciasis Control' (APOC) in combating the blinding disease, onchocerciasis have allowed it to push its aim beyond control to the possibility of elimination. This condition affects populations which are marginalized and hard to reach-at the end of the road. Its strategies for mass drug distribution has laid a blueprint which has been adapted by mass distributions programs in health (other NTDs) and its use of community directed distributors has galvanized the possibilities of community level health workers in other programs. In 2006, WHO estimated that the number of people affected by trachoma had fallen from 360 million in 1985 to 80 million in 2006. Trachoma is a disease of poverty needing interventions for surgery and antibiotics as well as interventions which address the social determinants of health-the availability of water and environmental sanitation for cleanliness and flies control. The Global Elimination of Trachoma program thus contributes to MDGs 6 and 7. In September 2011, at a high level UN meeting on noncommunicable disease prevention and control, it was noted that noncommunicable diseases (NCDs) currently contribute to 63% of global deaths and that success in global health cannot be achieved without coordinated efforts to incorporate NCD prevention, control and care into the current MDGs work stream. Fundamental and common to all these programs, is a well-integrated and fully operational health system, a primary health care philosophy which is pro-poor, accessible to all citizens, including the marginalized, vulnerable, and hard to reach. The Africa Program for Onchocerciasis Control developed and championed the highly successful community directed approach. Many of the leading causes of blindness, cataract, glaucoma, diabetic retinopathy fall in the category of NCDs. For the future, innovative integrated and life course approaches to health in the control of the NTDs and the NCDs are required to achieve this MDG. Access to safe drinking water and improved sanitation were targets set at the launch of the MDGs. The progress in drinking water target may be exceeded except in poor rural populations. It is estimated that 2.6 billion people still lack improved sanitation. The rising percentage of the population in urban slums has further heightened the need to focus on these two targets. In addition, MDG 7 targets forest loss-the rate of deforestation shows signs of decreasing-but success in reduction in the loss of biodiversity and marine resources has not been as successful. Climate change and its effects in the Sahel, the increase in slum dwellers, the continuing lack of water and poor sanitation are challenges shared with eye health programs and essential to control conditions such as trachoma and combating malnutrition. VISION 2020; The Right to Sight, is a global initiative of the partnership between WHO and the IAPB, which is replicated at the regional level and operationalized at the national level. It has provided the platform for the achievements in eye health VISION 2020. The APOC and the Global Elimination of blinding Trachoma (GET) 2020 partnerships have also been major factors for the success of the program, and this has been extended to the increasing control over NTDs in many national programs. These partnerships are an example of an achievement of MDG 8. To be recognized as full partners contributing to build a more equitable, prosperous and safer world, eye health programs have contributed and should continue to contribute to the achievement of MDGs. It is essential that eye health programs work in an integrated manner with other programs within and beyond health for the achievement of the MDGs by 2015. A cross-cutting issue identified for the achievement of the MDGs is the need to focus on disparities and the need to collect data and information, which will allow the identification of these disparities within and between countries. In addition to quantity, a focus on the quality of programs is being given a high priority. The recognition of the importance and urgency of addressing disability and its functional limitations augurs well for eye health programs whose main focus is on a disability, visual disability. It positions Vision0 2020-The Right to Sight-as part of the development agenda. This comes with an expanded responsibility in its effort to align with the MDGs and to anticipate and participate in the discourse on Development Goals-Beyond 2015. World Health Organization. Achieving health millennium development goals: Situation analysis and perspectives in the African region. Geneva: WHO; 2000. Document no: AFR/RC55/9. Available from : http://www.afro.who.int/index.php?option=com_docman&task=doc_download&gid=427&Itemid=2111. [Last accessed 2012 Aug 9]. World Health Organization. Prevention of blindness and deafness. Global initiative for the elimination of avoidable blindness. Geneva: WHO; 2000. WHO document WHO/PBL/97.61Rev2. World Bank. The role of quality in MDG progess. In: Global Monitoring Report. Washington: World Bank; 2007. p. 67-104. Available from : http://siteresources.worldbank.org/INTGLOMONREP2007/Resources/3413191-1179404785559/Chp2-GMR07_webPDF-corrected-may-14-2007-5.pdf. [Last accessed 2012 Aug 9]. Sen A. Development as freedom. New York: Akfred A. Knopf; 1999. Evans P. Collective capabilities, culture, and Amartya Sen's development as freedom. Stud Comp Int Dev 2002;37:54-60. Faal H, Gilbert C. Convincing governments to act: Vision 2020 and the millennium development goals. Community Eye Health 2007;20:62-4. Gilbert CE, Shah SP, Jadoon MZ, Bourne R, Dineen B, Khan MA, et al. Poverty and blindness in Pakistan: Results from the Pakistan national blindness and visual impairment survey. BMJ 2008;336:29-32. Reskinoff S, Pascolini D, Etya'ale D, Kocur I, Pararajasegaram R, Pokharel GP, et al. Global data on visual impairment in the year 2002. Bull World Health Organ 2004;82:844-51. Polack S, Eusebio C, Mathenge W, Wadud Z, Mamunur AK, Fletcher A, et al. The impact of cataract surgery on health related quality of life in Kenya, the Philippines, and Bangladesh. Ophthalmic Epidemiol 2010;17:387-99. Demissie BS, Solomon AW. Magnitude and causes of childhood blindness and severe visual impairment in Sekoru district, southwest Ethiopia: A survey using the key informant method. Trans R Soc Trop Med Hyg 2011;105:507-11. Muhammad N, Maishanu NM, Jabo AM, Rabiu MM. Tracing children with blindness and visual impairment using the key informant survey in a district of north-western Nigeria. Middle East Afr J Ophthalmol 2010;17:330-4. Courtright P, Lewallen S. Why are we addressing gender issues in vision loss? Community Eye Health 2009;22:17-9. Khan AA, Khan NU, Bile KM, Awan H. Creating synergies for health systems strengthening through partnerships in Pakistan - a case study of the national eye health programme. East Mediterr Health J 2010;16 Supple:S61-8. Lake A. To improve maternal and child health, focus on the neediest. In: Kirton J, Koch M, editors. G8 Deauville. Washington (DC): Newsdesk Media Group; 2011. p. 60-1. Foster A. Childhood blindness. Eye (Lond) 1988;2 Suppl:S27-36.